Friday Alex had a great day at therapy and his therapist Miss Erica, praised him and pointed out to Chad and I how great he is doing, how hard he is working and how PROUD she is of him. As you know we got Alex's prom tickets this past week at Ed White and In both Occupational and Physical therapy they worked on dancing with him, lol! Getting that balance, stamina and left hand to cooperate on what we need it to do! Friday was just a great day and I think he may have been showing off a little to Chad as he doesn't get to come often. He won't be break dancing by any means but he may be able to stand to a whole slow song, sway and look like everyone else for that matter, lol! If you have any connections with a limo service or know a driver, please put me in touch with them. I want Alex to have the night of his life for prom being he has missed both his jr and senior years at high school. I want this to be a night to remember for his high school years and instead of momma taking him... it would be great if I can send him off in a limo for some independence! Not looking for a handout.... just an affordable price if there is such a thing, lol! Friday night the boys and I headed to the movies... Brooks and Alex to see the Green Hornet... Kinlin and I to see "No Strings Attached". Alex did great... I'm so proud of him... he has finally gotten to where he can sit through a whole movie...YAY! IT'S A BIG DEAL.... trust me! Two things......Before I forget let me announce that we are having another volunteer meeting to plan the agenda for the day of the celebration and finalize plans ..... placing volunteers where they need to be for that day. The meeting will be on Thursday, February 3rd 7pm at Macedonia Baptist Church - 8081 Lenox Ave. on the West side. We are in need of many volunteers so that no one has to work more than a 2 hour shift that day and can also enjoy the festivities. If you think that you will be able to volunteer that day and would like to be a bigger part of Team Alex... please join us this Thursday! Secondly, Please let me know if you have any connections to printer services.... we are in desperate need of getting our flyers printed out at a minimal cost along with some window decals that we would like to sell at the event. We need about 100 of each. If you can put us in touch with a printer who can provide both services at a fair price, please send me an email at alexrosstrust@gmail.com so we can get them printed this week! .....AAAAAAMAZING! I tell you what... when God gets a hold of you and lights you on fire... HOLD ON.... You are in for the RIDE OF YOUR LIFE! When I pray to him... I always ask him to let my light shine for him.... and then I wait. And I wait... and I wait... because we all know that he does things His own way, in His own time, according to His plan! The funny thing... I HAVE been shining my light for him... I just didn't realize it, but NOW he has just sparked the flame and maybe added a can of hairspray, lol! There was a great band, Celebrate & Recovery (I think) and Karen - Gabi's mom sang with them and MAN CAN SHE SING! WOW! Fantastic speakers... each "TELLING THEIR STORY" which is part of the message. Soooo many of us don't share our story... we sit quietly in the background... when we could be disciples for him and changing lives with our story. Even though I knew that this happened to Alex for his Glory.... JOHN 11:4 never had so much meaning to me until he opened my eyes and MADE ME SEE and truly understand. You know how I always tell you guys that it could always be worse.... well I'm not downplaying what we have been thru by any means and each person's journey is different and even I as I hear someone tell their story... I sit back and say... " I don't know how she did it... I can't imagine going thru what she has gone thru". But in my heart of hearts... I know how she survived... I know who and what gave her the strength. HE did! One of the speakers, Rachel Faulkner, couldn't have been more than 33 maybe if that.... married her college sweetheart and while playing basketball with his buddies, dropped and passed away from a brain aneurysm only after a couple years of their marriage. Distraught as you can only imagine.... instead of getting bitter... she praised God and thanked Him for all that she had been given and trusted that He had a plan that was bigger than she. She continued to share her story of how after the funeral many many people were at her house and her friend looked at her and said "I just don't know how you are doing it". She then proceeded to tell us how her friend Melody, I think she called her, asked if she could talk to her in another room. Rachel led her friend to know Jesus Christ that day and she firmly believes that had her husband not died that she doesn't know that her friend Melody would have ever discovered Jesus. She like me in many ways, or so I like to think, lol.... try to find the positive and the good in what has happened in our lives. She went on to share her story of how she met another wonderful man years later and it just so happened by the Grace of God that she was able to love that way again. You see, even though she didn't know it... his parents were best friends with her late husbands parents and so God made it possible that she could keep all her families because they were already intertwined and it was a match made in heaven after all she had been thru. They had two beautiful beautiful children and he was a pilot. One day I think she said she was coming home from the grocery store or somewhere and she received a call... yes this is when I looked at Kinlin because I knew what was coming next and I said... "YOU ARE KIDDING ME".... yes... it was a call from the base commander saying that her husband had been on the runway taking off and something happened in the wing as they were taking off and the plane flipped over and he and the other guy were killed instantly. Here she is... two husbands taken from her.... 2 children left to care for on her own... back then I think they were like 2 and 4 months maybe? Now her oldest is 5 I think...anyways... you get the point. Can you imagine losing 1 husband let alone 2 before you reach the age 35? And let me tell you what... she didn't get angry at God... she didn't question why... again she said she just PRAISED HIM for all that she had been given! Sooo many of us complain and belly ache every day over the SMALL STUFF..... we DO have soooo much to be thankful for! We should be doing the same and praising him for what we have been given and not what we haven't. Our many many blessings are right in front of our faces! Today I visited Journey Church in Orange Park. Kinlin and Brandon are looking for a new church and asked if I would like to visit with them. This would be their second time... they liked it but weren't really sure if it was the fit that they are looking for. As a friend... she wanted my opinion. Chad's schedule doesn't allow him to go to church with me on Sunday mornings as he works Sun-Thursday so today was a breath of fresh air for me. Sometimes you gotta throw a little change in your step to get your fire lit again....this why I attended the Womens Event and visited a new church. My HOME is Macedonia Baptist Church... don't get me wrong... they are my peeps and my roots grow deep there. Let me tell you how God works! We walk in Journey Church.... sit down, get ready for the service and as we look up on stage... IT WAS THE BAND FROM THE WOMENS EVENT...coincidence....I say not! I told Kinlin I thought it was a sign for her .....there was her answer that she had been looking for. HOLD FAST FOR THE WORD OF GOD! Today's message at Journey tied my whole weekend experience up together all in one! God sent me there today to finish filling up my cup.... and it's overflowing! Let this sink in and hear me when I say this.... If all prayers were answered as soon as you prayed them, you would start putting your faith in your ability and not the power of JESUS! again... HOLD FAST FOR THE WORD OF GOD. Between the promise and the payoff ....THERE IS A PROCESS. Sit tight and just weather the storm...... this too shall pass. Was God speaking to me today??? You betcha he was! 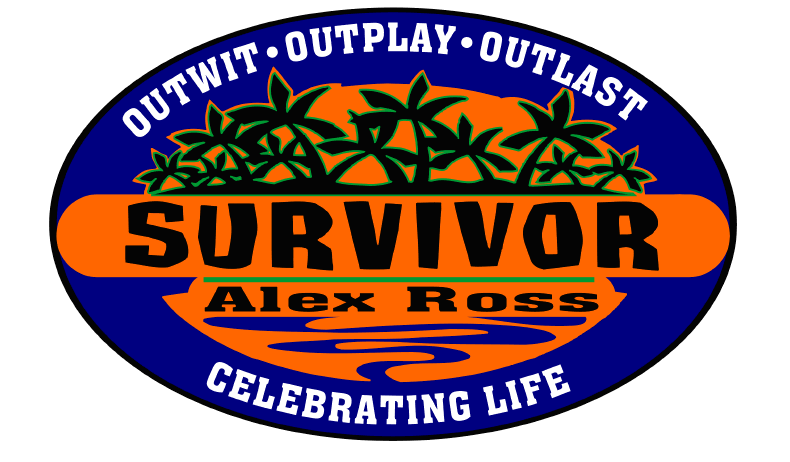 I have stayed positive through this whole process.....focusing on Alex and not the drama of the case and who, where, what, when and why. Focusing on Alex..... He is the LIGHT.... HE is working in and through and ALL AROUND Alex every single day. He kept my eyes focused on HIM! John 11:4.... I GET IT! Hearing the women share their stories this weekend.... I GET IT! He brought me to it....now I understand..... actually understand IT! Like many of you tell me daily how much I inspire you.... thank you.... they have inspired me! God grabbed a hold of me and shook me and said... "CHECK THIS OUT!" "See Lisa.... this is what I have been trying to tell you"! It's one thing to hear it from others... it's another to live it and try to profess it.... but you can't fully get it until you UNDERSTAND it. It is then that God can begin to light that fire under you and send you out into the world so that you can share his message.... the right way! So many of us pray and expect him to say "ok, here you go". He isn't a drive thru.... we can't just pull up and order what we want and get it! Between the promise and the payoff....there is a process my friends. He has a plan. It's His way or the highway and trust me... you don't wanna go down that highway! Alex's story is a GREAT story and I hope that if some of you are lost and aren't going to church that you fix that. Start telling your story today.... PUT HIM FIRST in your life and the rest will all fall into place. Today is a Gift... Tomorrow is not promised.... One phone call can change your life FOREVER! Stop putting off till tomorrow what you can do Today and make that decision to better your life.... Let Go and Let God. Tomorrow may be too late for some and I don't want to let one person go without knowing what it is like to "Walk the Streets of Gold" and stand in the presence of HIM! Whatever you are struggling with.... finances...sickness....relationship..... Ask God to take control. He wants to... so let him. Give your heart and your everything to Him.... aaaaaaaaaaaaahhh the peace that will come over you is like non other! I knew all along that he was standing right beside me.... MY ROCK.... giving me the strength to get thru each day and deal with my little brain injury 24-7 and all the craziness that goes with that. Fill your cup up... spiritually. I have so many things to be thankful for and as I have shared many times.....things could always be so much worse. My life isn't easy by any means..... financially holding on and struggling with the future and what it will or won't bring, when and if I will ever be able to go back to work. Chaos in our every day life where nothing is normal anymore...... I lost a son that I once knew and am heartbroken and miss that Alex terribly especially when I look at old videos and pictures. However.... I am a stronger Christian because of what cards I have been dealt and I will praise him in the midst of my anguish because God got my attention that fateful day and brought me to a screeching halt. He chose us for a purpose... a higher purpose. I need to Glorify His Name and share MY story. Quit sitting in the darkness... share your story.... YOU NEVER KNOW WHOSE LIFE YOU WILL CHANGE FOR THE BETTER! The message today in my visit to Journey Church.... You must make a big deal out of your small beginnings so you can see the payoff in the Promise! Share your story this week....it can make all the difference in the world to someone who is lost! Asking for you to stop what your doing at this moment for one minute and bow your head in prayer for one of our prayer warriors this morning. I asked you on Monday to pray for Connie and her 9 year old son Derek as he had stopped breathing.... it took doctors awhile to get him to respond and when they finally did at the hospital, they thought he may be brain dead. I sent her an email yesterday just to follow up and check on her and received an email back that sadly.... Derek had passed away and is now dancing with the angels in heaven. I immediately began to weep because as a mother and knowing what I have gone thru, I can somewhat relate to her and the loss of her child. Any of you as parents can only imagine what it would be like if you lost one of your children. Please lift her up in prayer and ask God to give her the strength, peace and comfort that she is going to need to get thru this. She did share great news that she had donated his organs and that he would be helping 6 other children and she was hoping to meet the families and share Derek's story. Lord, I know only you have the answers as to why our children have to go before we do and I know you had a special plan for Derek. I tell myself you needed another angel up there and Derek was just what you were looking for. I ask that you please wrap your arms and constant love around Connie and her family Lord. I pray that you make it possible for Connie to meet and know the children that Derek has helped out by donating those organs. May it bring her some joy and peace in doing so.... to know that even though his spirit is with you, that he is doing great things still here on earth. I am sooo heartbroken by the loss of Connie's son and I pray that she turns to you for the grieving that she is about to endure. Only you can give her what she needs Lord and I ask with everything in me that you give her just exactly what she needs and when she needs it. Thank you Lord for your abundant love and many blessings you give to each and everyone of us on a daily basis. You are an awesome God and even though this is not the outcome that we would have wanted, I thank you for the 9 years that you gave Connie with her son. Amen. John 14:1-4 Do not let your hearts be troubled. Trust in God; trust also in me. In my Father's house are many rooms; if it were not so, I would have told you. I am going there to prepare a place for you. And if I go and prepare a place for you, I will come back and take you to be with me that you also may be where I am. You know the way to the place where I am going. 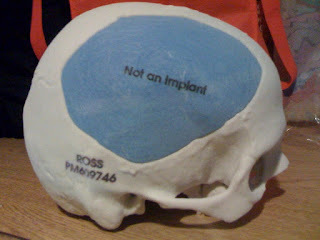 I decided to share some of my research today.. a little BRAIN INJURY 101 ..... lol! with many brain regions, especially with the parietal lobe and the limbic system (emotions). part, the right frontal lobe controls the muscles on the left side of the body and the left frontal lobe controls the muscles on the right. For this reason, injury to one side of the frontal lobe often causes weakness or even paralysis on the opposite side of the body. Yet there is much more to the human frontal lobes, since the prefrontal cortex contains many of the neurons we associate with the broad spectrum of human behavior. debilitating since the frontal cortex is where ideas are initiated and these ideas have to "go"
may exhibit a host of complex problems in their activities of daily life..
injured, the person may not be able to “learn from mistakes” and repeat unwanted behaviors over and over again. 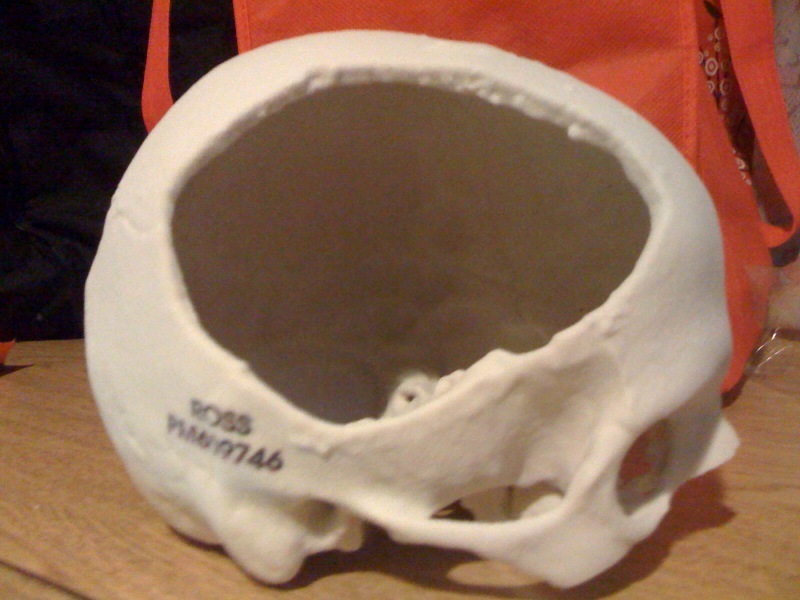 individuals with prefrontal lobe injuries. functioning has been diminished by the earlier injury. behaviors over and over again. learning or memory strategies would be introduced and taught. Makes me understand a little better... I guess lol! WOW... sooo many feelings rushing back in by reading her blog. I am so very lucky and as she and I both know.... "A MOMENT CAN CHANGE YOUR LIFE....FOREVER". Thank you Lord for continuing to work in and thru Alex. Thank you for your daily blessings that you bring to me and my family. I know that things could always be worse and am truly thankful that we are finally on the UPSIDE or rather DOWNSIDE of this roller coaster ride. I give you all the Glory, Honor and Praise... AMEN! Matthew 15:28Then Jesus answered, "Woman, you have great faith! Your request is granted." And her daughter was healed from that very hour. I gave it all to you God and you answered my prayer. THANK YOU! Feeling lucky today and very thankful for my many blessings. Have you thanked HIM today? Alex had a great day of therapy today with walking on the treadmill with NO harness. He is being supported by a belt with one of the therapist only to make him shift his weight to the left side. He still doesn't trust that left side and so he tends to walk a little crooked leaning to the right side lol. Other than that he did fabulous today. He also has gotten to where he does not sit during PT at all. So for 45 minutes he is standing or exercising. Building that stamina up so that he gets stronger to walk for longer periods of time. As we were leaving therapy today Alex wanted to walk to the car... GREAT! Not only did he want to walk to the car.... he wanted to push me in the wheelchair to the car! Sooooo, I sat in the wheelchair while he pushed me from the gym to the car with his therapist spotting him. I AM SOOOO PROUD! he did an awesome job today and I tell you what.... he is really living up to the term "SUPERMAN SPEED RECOVERY"!!! Below is a picture of the Trach hole.... it is closing up! One of our prayer warriors is in need of your prayers, knows the power of prayer and knows that God performs miracles daily. Connie's son Derek is 9 years old and suddenly stopped breathing. They were unable to revive him until he got to the hospital and they tell her that he may be brain dead and he is currently on life support. PLEASE lift her and Derek up in your prayers that God will continue to work in and throughout his little body from his head to his toes. Lord I pray that you wrap your arms around them, give Connie the peace and comfort in knowing that she will put total faith in you and that you are in control. I pray that Derek is in no pain and that you begin healing him and increase his brain activity so that we know he will be ok. I know Father that you ARE in the drivers seat and that this is part of your bigger plan even though it is hard to fathom why this happened. So Jesus answered and said to them, “Assuredly, I say to you, if you have faith and do not doubt, you will not only do what was done to the fig tree, but also if you say to this mountain, ‘Be removed and be cast into the sea,’ it will be done. And all things, whatever you ask in prayer, believing, you will receive.” (Matthew 21:21-22) We call out to you Lord..... hear our prayer.... AMEN! Thank you my prayer warriors... LOVE YA'LL! WE WENT TO VISIT A SPECIAL FRIEND! Friday was a teacher's planning day so Brooks' was home and decided to go to therapy with us after much convincing by his brother, lol. As we pulled up to the parking lot and proceeded to get out, Alex announces that he has to pee. Well, the therapist and I have come up with an idea that we want him to walk into therapy with his cane, granted I probably should have pulled up to the door....I'll know better next time, lol. As he is getting out of the car.... he is insisting for us to put him in his chair so that we can hurry him to the bathroom..... we keep saying no that he needs to hold it and walk in. Brooks clearly joking and not thinking says..... "just go here". SO HE DID! He doesn't turn around to face the car to conceal his weapon..... he just pulls his pants down...standing at the door of the car, FACING ALL THE OTHER CARS AND PARKING LOT mind you, and proceeds to urinate in the parking lot! I am freaking out..... my eyes racing to all the cars in the lot to see if anyone is actually IN THEIR CAR in fear that they are witnessing Alex, my 4 year old at this point, just a cracking up with Brooks, with a huge arc of pee urinating in the wide open space of a parking lot! WHAT THE FRENCH TOAST???? OMG! there was absolutely no way I could stop him in fear he would pee all over himself and then therapy would not go over so well.... as I scan to the front of my car I notice a LADY SITTING IN THE DRIVER SEAT of the van directly in front of me!!! She was witnessing the act....the good thing is that his door was blocking his weapon... however, I can almost guarantee she could see the stream coming from the door and could guess what was going on as I am flailing my arms about, freaking out and yelling at Alex to stop.... Brooks is cracking up, he can't believe he actually did it....... LORD HELP US ALL! Alex, Alex, Alex..... what were you thinking? My little well Big 4 year old looks to me and says... "Mom, Brooks told me to go right here!". Can we say... traumatic brain injury much? Thank God he will start back at Brooks Day Treatment on Feb 7th for Tuesdays and Thursdays to get those executive and social skill learning because momma can't handle anymore episodes like that! At physical therapy he was learning to balance and shift his weight to his left leg. As he is doing this, you will see him singing me a lullaby.... as he sings, you can hear him sing about peeing in the parking lot...NICE....not! From therapy we took a road trip to one of the local hospitals to visit a dear friend of ours... Rich Collier, the jaguar player that was shot 14 times, lost his left leg and is paralyzed from the waist down.... back in September of 2008. He has kept up with Alex since it first happened and we have formed a special friendship with he and his wife. He is having some of the bullets removed as his body is rejecting them and he is in a lot of pain. We had an awesome visit and stayed for about an hour and as always Alex has him replay that night he got shot. He sits there and listens like a kid at the foot of Santa Clause, lol.... asking question after question.... even though he has already heard the story probably 10 times ha! He is fascinated by Rich surviving..... not even thinking about himself and his survival. I think he is more impressed with Rich's story than his own, lol! Both are truly God's miracles and his wife and I know how blessed and highly favored we are that they are both still with us. Alex gave up his bullet necklace to Rich as a keepsake and reminder of how precious life is and what God has done for both. Please keep Rich in your prayers as he goes into surgery this week..... he is in a lot of pain of which I can only imagine. He begins his new semester this week.... Algebra II, Ecology, American Govt, Economics and English IV. PRAY FOR US, lol. He doesn't like ANY of these courses so this is going to be a challenge for sure! As for his teacher.... they say we get to keep her for now. The email I received 4 days later mind you......was condescending and I did NOT like the tone with which it was written. Empathy, compassion and understanding it was surely lacking! So please continue to pray because even though we keep her for now.... the letter left it to mean that at any time they feel the need... they will pull her and I will cooperate. Nice huh? Not so much!!! However... as always... 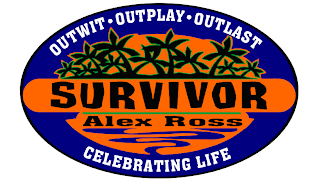 I will continue to focus on the positives and focus on Alex .... one day at a time.... it's what get's me thru to the next day! 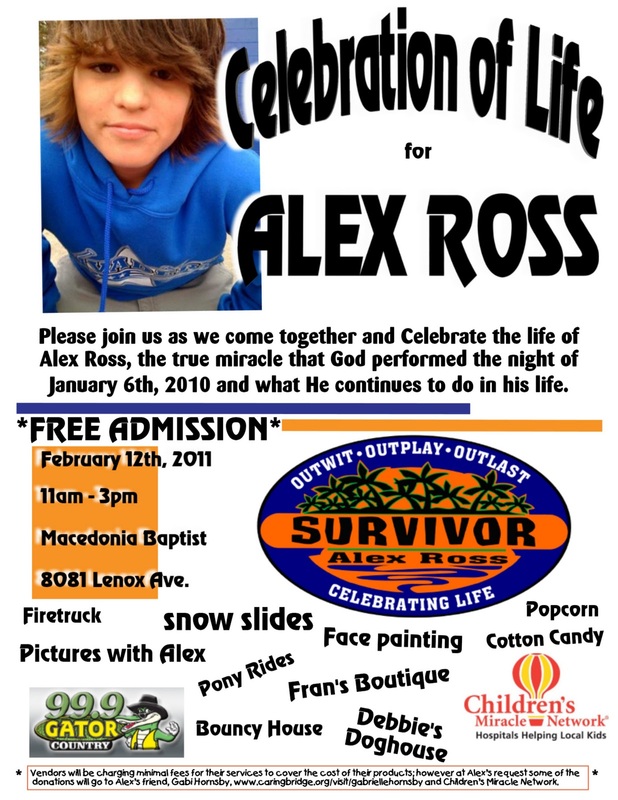 We had a great meeting yesterday in regards to the "Celebration of Life" event for Alex.... his homecoming party if you will... FINALLY! We had about 25 in attendance....THANK YOU ALL SO MUCH FOR COMING and taking time out of your weekend to help out with this! We are still in need of volunteers if you could give us 2 hours that day to work a table that would be AWESOME! The event will be held from 11-3 on Sat Feb 12th in the church parking lot across from Macedonia Baptist Church. We had lots of great ideas yesterday and as soon as we get our answers .... we will have a press release with all the festivities of the day. If you want to pre-order a shirt so that you ensure that you get one... or are needing a special size ie. youth or XXL, please send me an email to alexrosstrust@gmail.com so that you will be able to pick it up on the day of the event. I have to pay for all shirts upfront so I am only going to order a limited amount in fear that I won't sell them all and be out of pocket the money. All orders are due by this Friday, January 28th. Wishing you all a great work week!! DOING GREAT WITHOUT THE TRACH! Alex has been doing fantastic without the trach! I slept with him the first night just because we were both leary of how he would do with his breathing. While he slept like a baby.... momma was on guard and I tossed and turned all night, lol! He does sleep noisily if that is a word, lol.... He has many sounds of his breathing while he sleeps and hopefully this will dissipate once he retrains himself how to breathe properly, but overall he is doing fantastic without the trach....THANK YOU GOD! Doc said it will take about 1-2 weeks to totally close up and heal. I am hoping that all heals well and the scar tissue isn't too much... if so, she said if he wants we can do some cosmetic surgery to make it not so noticeable. I still haven't heard anything in regards to the teacher and emailed the principal on Tuesday! Please continue to pray that all goes our way and we get to keep his current teacher. Alex only gets her 2-3 hours a week so if he can't keep his same teacher.... I am going to take on her work load because it isn't worth it to cause the stress and change in our daily routines. Alex has been a busy bee these past two weeks with mid-terms and finals in the 7 classes he has been taking. I found out yesterday on our way home from therapy that he has an English IV mid term and an Ecology mid-term DUE TODAY... that I knew nothing about...NICE! Sooooooo, today shall be a busy day for him as well. He has been working on his geometry and algebra ones..... they are very intense and he tires easily and really only has about 15 minutes of good attention and focus so it makes it hard to complete a 72 question final and 25 question mid term! AAAAAAAAAAAAHHHHHH. Ready for this week to be over already. Him graduating and walking with his class will be ALL WORTH IT!!! We went to REMIX, youth church, at Macedonia Baptist Church, our church, last night.... great service! Alex surprised us all by wanting to get up in front and speak.... brought tears to my family's eyes for sure. He talked about what God has done for him and how He saved his life.... he thanks HIM everyday and then ended it with a bible verse John 3:16 that I had no idea he REMEMBERED! CRAZY! I haven't been taking Alex to church on Sundays because there is no way he can sit still and QUIET for that amount of time... however I am very proud of him at last night's service and it is much more laid back than regular church service. JOE MOORE... I love you and you rock! Thank you for making REMIX a place where kids can relate to God and for keeping it real. You know how to talk on their level and they understand the importance of walking with God. Alex asked Brooks to rate church last night on a scale of 1-100 and Brooks gave it 100%!! When we asked Alex what his rating was he said 1.25 past 100, lol! I think REMIX is going to be a great start for Alex to ease back into the social setting of church and am excited about the boys getting on fire for God! THANK YOU JOE MOORE for creating that environment....God put you exactly where you need to be!!! Funny story about Alex real quick.... the other day we were driving home from therapy and there was a guy standing on the side of the road with a sign... WILL WORK FOR FOOD at a red light. Alex was BEGGING me to roll down the window so he could give him his Snickers bar that he was eating!!! Thank God the light turned green at that point and I had an excuse not to roll his window down, lol. Sad thing... he was dead serious... he wasn't doing it as a joke... he sincerely wanted to give that man his candy bar that he was eating... My little 4 year old, Alex... I love you! Hopefully he can start day treatment next week and start getting those executive skills back on track as well as some neuro-psychological sessions in as well. This is an example of how Alex still has a long way to go mentally. For the most part yes he is good.... but he still has issues with post traumatic stress disorder, attention span, thought processing skills etc. so I can't wait for him to get all of the psychological sessions and skill learning that he will get once he is back in day treatment. He has been doing great sleeping in his room as well...knock on wood. He definitely has come a very long way in just a year's time. GOD IS GOOD! Below is Alex showing off his new stair stepping skills that he has been working on this week..... doing it all by himself!! SO PROUD!! We only started videoing on his way down but his walk up the stairs was VERY IMPRESSIVE and he did not need my assistance at all! Here you can see him working on walking with a regular cane! Doing fantastic. If you listen to him talk.... he is telling us that he is going to wear his superman underwear as a speedo in Hawaii for his bathing suit....NICE! HA HA! 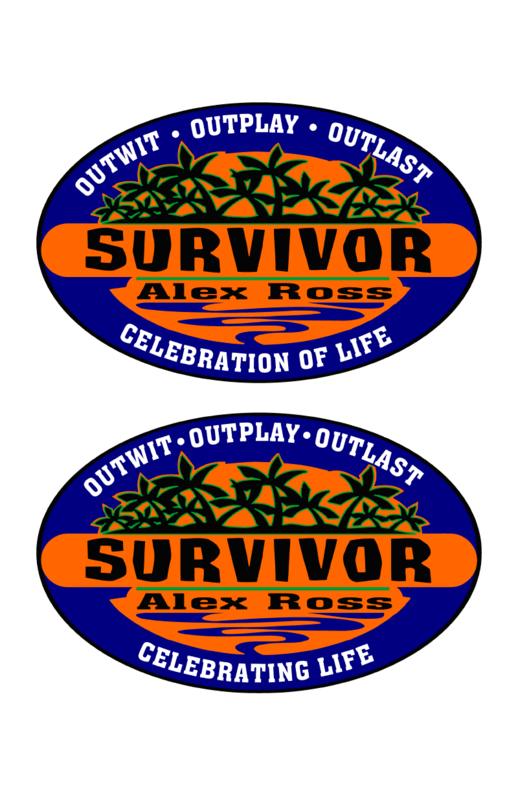 The back of the shirts will say TEAM ALEX with a scripture reference that we have not decided on yet. I have had several requests for the necklace that Alex and his brothers wear.... if you are interested in purchasing one, please let me know as we are considering selling these before and at the event. The only difference will be that they will be on a dog tag chain and will have no engraving as the boys want to keep theirs special this way. Brian said he will sell them for $ 10.00 before the event and $15.00 on the day of the event. Email me if you want one please as he is only going to buy a limited amount of them. Miss Rhonda, Alex's personal photographer, lol... is taking the boys to the Circus this Saturday at 3:30.... EVERYONE PLEASE PRAY FOR HER, ha ha! What an adventure that is going to be!!! Closing for now.... have to wake the boy up for some schooling to finish his exams.... aaaaaaaaaaahhhhh! TODAY IS GOING TO BE A GREAT DAY...right?? ha! BYE BYE TRACH...... YOU ARE OUTTA HERE! OMG...... Can you believe that this day finally came! WOW! I got the text this morning to come in at 3pm that there was GOOD NEWS! I would say it was GREAT news, lol! We headed out today at 12 with Kinlin, Brooks and Rhonda (Alex's personal Photographer) of course, lol! This was a day for PICTURES AND VIDEO fo show!! Thank you God for making today possible.....I know I was impatient however I know that all this is to be in your time line...not mine. I am still learning this, lol. We've been through a lot and it's been rough learning that all this is in God's plan and on his time, not ours. Patience is not a virtue of mine.... but honestly most of us are that way. We want things when we want it... a fast paced world we live in.... we want things johnny on the spot. I am so thankful that I serve an Awesome God who knows me inside and out.... who has been right by my side through this whole ordeal.... picking me up when I am down.... giving me that inner strength to fight past those days when I think I can't take anymore..... He shows me people... he puts people in my life either at the doctors office or rehab that makes me understand and see through a different pair of eyes that someone always has it worse than me! I can't say it enough to you ..... BE THANKFUL for the little things in your life.... take it day by day... count your blessings and then count them again. LIVE FOR TODAY....that is sooooo important.... LIVE FOR TODAY! Hug those babies tight.... look at their faces.... kiss and hug them... express your love to your loved ones.... say I LOVE YOU everyday... 100 times a day! I hate that Nick is so far away.... I always worry about him... especially since all this has happened. So for those of you who have your children close..... hug them for me, lol! I can't hug Nick every day... I'll text him sending hugs and kisses... but its not the same. So do me a favor and savor every moment with your children while you can.... because one day...they will be grown and gone and you will be wishing they were tugging at your pant leg or screaming your name to spend time with them... I know that I sure do! I thought today would never get here and that we would be heading back to Atlanta for another surgery for sure.... another scenic route! I now feel like we are FINALLY get past the past and moving on to the future with no more distractions in our way..... well besides the whole teacher thing. Hopefully that will be resolved this week and we can get back on track with everything SUPERMAN SPEED.... or as Alex would say... "GOD SPEED AUSTIN"... some quote from a movie, lol! Below is one of his video's from therapy today... I have more to download but it's taking forever and I want to get this published. You can see how hard he is trying.... I AM SO PROUD... TODAY WAS A GREAT DAY! Thank you for all the prayers, love and support... I know you are all beaming with joy and celebrating with us today that the trach FINALLY came out! THANK YOU JESUS! THE TRACH COMES OUT TODAY! I just got word from the ENT that we are to be there at 3pm so that they can PULL THE TRACH!!! THANK YOU JESUS! Today is a great day and going to be one step closer to recovering without any more complications...or surgeries... SUPERMAN SPEED AGAIN!!! I will write more later about our experience and try to video it coming out, lol! HAVE A GREEEEEEEEEEEEEEEEAT DAY.... WE ARE!! Alex has had a great week of therapy last week.... working at his full potential! We really had a great week .... we are trying to get him back into day treatment for two days a week so that he can get some executive skill learning which will help with the filtering of appropriate and not so appropriate words and timing. He will get the social interaction that he needs to enable him to reenter society and socialize in an acceptable manner.... relearn the do's and don't of proper etiquette if you will. YAY! So we had a really great week like I said until Friday came. THEN THE CRAP HIT THE FAN! I get a phone call from Hospital Homebound stating that they are going to change his teacher.... the one that has been with him since his 2nd day at Brooks Inpatient Rehab. Anyone who knows us and what we deal with on a daily basis... surely WOULD NOT do such a thing and throw a wrench in our already complicated and stressful days! Consistency.... routine.....this is what gets us through each day. You know what happens when I change something in his everyday schedule or we do something out of the norm... he turns into some OCD RAINMAN and I have to deal with the repercussions of the aftermath. I cried all day Friday because I KNOW what this is going to do to Alex... what that will in turn do to me and my days.... but most of all... we are going to REGRESS. We are sooo close to graduation that I cannot afford a setback such as this at this point in his schooling. He has trust issues... he has attention issues.... and after speaking with his cognitive therapist... for Alex with an injury as severe as his and post traumatic stress disorder that he still exhibits.... this can be detrimental to his success in his finishing the 12th grade on time. ROUTINE... CONSISTENCY.....SCHEDULE....TRUST.... these are all vital parts of his world as he knows it now. Because he knew what was going on Friday, his therapies on Friday afternoon suffered because he is freaking out worried about what is going to happen this week with his teacher and so on. I am going to do everything in my power to keep his current teacher or I will finish with him myself. We only get her 3 hours a week now.... what's 3 more hours to take on myself... really??? It would be worth it more for me to take on English IV than to have to introduce another teacher and start from scratch. I just don't have it in me to deal with the repercussions from the change in his environment. He is already stressing and freaking about going to day treatment and now they want to throw this at him? I have ENOUGH stress in my life without adding more on top. PRAYERS NEEDED please please.... It is vital that Alex be able to keep his same routine in school because we want him to graduate with his class and he has been doing so well. If it's not broke... don't try to fix it.... especially when we are sooooo close. Please pray that Alex is able to keep his current teacher for English so that his world is not completely turned upside down and then in turn so will mine. Yes I realize at some point he is wanting to go to college and there will be change... but he is not at that point now and who knows... it may take another year or 2 until he gets to where he is comfortable and fully recovered from his brain injury and post traumatic stress disorder. For now we need ROUTINE.... CONSISTENCY...SCHEDULE...TRUST in order to maintain somewhat of a normalcy in our lives. YOU MUST LIVE IT TO UNDERSTAND IT... I have no better way to explain it. I'm sure many of you have been following the Congresswoman Gabby's story.... so have we. HITS VERY CLOSE TO HOME! WOW! However... after speaking with several of Alex's nurses.... she is doing a WHOLE lot better than Alex was at that point. SO GLAD TO HEAR! The statistics are just unreal and you realize how much of a miracle she and Alex truly are! I sent emails to Gabby at her congressional website....and also to two of her friends/senators websites that were actually in the room when she opened her eyes for the first time. I know exactly what they were feeling and it all takes me back so quickly to those first two weeks in ICU with Alex. I was hoping to talk to or email back and forth with the family to comfort...give insight.... whatever I can do to get them thru the next months ahead and what they will be facing. A traumatic brain injury is a crazy thing and they are in for the ride of their lives. I think Alex would be such a great inspiration to them and it would give them hope for the future and what they are facing. I think if they read my blog they would relate and feel at ease to know that what they are going thru.... I have too and we survived! we are still surviving! Baby steps... day by day..... this too shall pass. There are always curve balls to dodge.... and life will never be the same... you just have to make lemonade out of those lemons and add a little sugar!! :0) I was checking my spam folder tonight and came across an email of a young gentleman, Matt, that wanted to put me in touch with Congresswoman Gabby's family...HOW CRAZY IS THAT! I'm sooooo excited! This is AFTER I sent emails out to the family and he had no idea that I was even trying to reach them. GOD IS GOOD AND WORKS IN MYSTERIOUS WAYS! I hope it all works out.... I truly believe that we can do some good in reaching out to them. Below are some videos of Alex this past week... we also got to meet some of his biggest fans... Katy Vega and her son Calvin. We met them at therapy last week and Alex even gave her his one and only bracelet and she was ecstatic!! A quick update on our little friend Gabi that we talk about often and she was also in the Tim Tebow documentary with Alex.... we went to see her on Friday. She looks great compared to when we last saw her in ICU at Wolfson's Childrens hospital shortly before Christmas. She was sitting up in bed.... Todd was feeding her some chocolate pudding or trying anyways. She has a feeding tube and has weird sensation in her right hand so it is difficult for her to read her braille. She cannot speak at the moment and gets frustrated because she knows what she wants to say but cant so she is working with a speech therapist twice a day to retrain that speech pattern again. Please keep our little angel in your prayers... we are soooo hoping that she will begin to recover from this last set back and get to go home. She lost her sight when she was two so I am really hoping that she can get to where she can atleast read braille with her right hand again so she can read again. PLEASE SEND PRAYERS UP TO HEAVEN SO THEY CAN GET ANSWERED..... she really needs them right now and you can never have too many! I am going to be holding a "Celebration of Life" meeting for those that want to be involved and volunteer on Sunday Jan 23rd. I will post the location and time of the meeting this week so please keep checking back if you would like to help out with the celebration or you have ideas.... the more the merrier! I am hoping to have it at Mudville Grille on beach boulevard but I need to check with the manager so I will keep you updated. I text the ENT on Friday to see if they had gotten any results from the sleep study and she had already placed a call to them and was told that she should have something by Monday...YAY! She said if all looks well then BELOVED trach will come out this week!!!! OMG.... WE ARE SOOOOOOOOOOO SOOOOO CLOSE! PRAYERS .....PRAYERS...PRAYERS....PRETTY PLEASE! Also... don't forget that if you want a tshirt from the celebration of life... please send me an email to alexrosstrust@gmail.com to reserve one for you. I will only be ordering a limited amount in fear that I won't be able to sell them and be out the money. Sooo to ensure you get a tshirt, if you want one... please email me the quantity and sizes. A quick shout out to our favorite JSO Officer...and very close friend of the family...CARLY REED... HAPPY HAPPY 29TH birthday today! WE LOVE YOU and thank you so very very much for all of your love and support over the past year and truly hope that today was one of the best birthdays ever! LOVE YOU CARLY BOO! Closing for now..... hoping to post good news about the trach tomorrow!! I woke up at 10, got Alex up at 11, we got ready and headed for therapy. HE DID SO GOOD TODAY!! ALEX COULDN'T DO THIS LAST MONTH AND STEADILY CONTINUES TO IMPROVE... HE TOOK THE BERG BALANCE TEST AGAIN ON FRIDAY. I f you remember I talked about how much he had improved last time... Sept he got a 24 out of 56. November he got a 35 out of 56 where he jumped 11 points and Friday he got 39 out of 56!! He is still improving and at a great pace! So proud! Today was actually the day, one year ago that we were told Alex had suffered stroking on the left side of the brain and they did not see him making it another 7 days! GOOD IS GOOD.... I'm so thankful to be off of that rollercoaster ride!! That was a night mare! 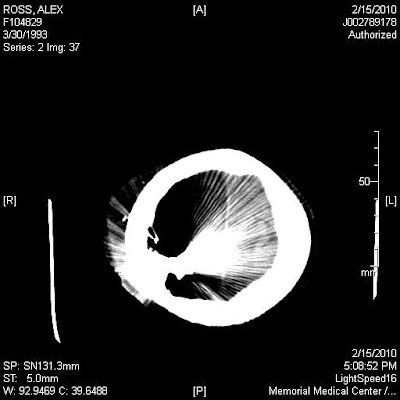 Below are two of the cat scans I talked about.... AMAZING TO SEE WHAT GOD CAN DO WITH SO LITTLE LEFT! THANK YOU MY SWEET JESUS!! 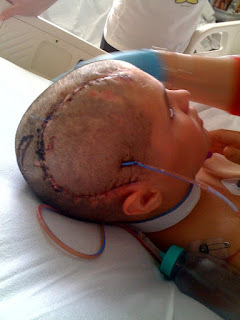 THE BULLET IS STILL LODGED IN HIS HEAD... will be there for the rest of his life. It travelled from the frontal lobe down to the back of his head. These images should make you understand just exaclty what God is capable of! Alex Michael is truly a miracle of God and by looking at these cat scans... should not be here today. THANK YOU GOD FOR A SECOND CHANCE AT LIFE! What an AWESOME GOD YOU ARE! We met one of our followers today Miss Katy Vega and her son Calvin. What a pleasure it was to meet the two of you! Alex was so touched by meeting Miss Katy that he gave her his only bracelet he has ever had right off of his wrist! He is such a sweet kid... at times, lol! Thanks for making us feel special today by getting to meet you and take some pics. Send them to me and I'll post on the blog. I have a meeting tomorrow regarding the "Celebration of Life"... please say a few quick prayers that we can finalize this location and get moving onto planning. I am going to be ordering shirts... a limited amount as they need to be purchased prior to the event. To ensure you get a shirt, please send me a quick email with the sizes you will need and I will make sure to preorder enough. I will be placing my order this Wednesday so please get me an email asap to ensure you get a shirt! Thanks so much to everyone for your prayers and support for the sleep study... I ask that you please continue to pray until I have the results in hand! Stay tuned.... more great things are in store for 2011! AND ON THE 7TH DAY HE PERFORMED A MIRACLE ON ALEX ROSS! WOW!!! What a surreal day yesterday was! Reliving that fateful day..I was up and down all day... in and out of tears....... getting together with close friends and family last night to watch the Tim Tebow documentary and seeing what a HUGE part Alex had in that! WOW! He spent a good two hours with us that day in the hospital and I tell you what... that prayer he prayed with us before he left was absolutely the HIGHLIGHT of my day! What an amazing young man and we are so honored that we were able to be a part of his documentary. TIM TEBOW.... OH MY GOSH! I still can't believe it! When they contacted us and asked us to sign a release, I just figured that he would be shown in the background or you would catch a glimpse of him.... HE HAD A WHOLE SECTION! WOW! "THE ALEX ROSS VISIT".... WOW! Thank you, thank you thank you Tim Tebow!!! You will forever be tied to our hearts for what you have done for my boy. I can only hope and pray that my boys grow up to be half the young man that you are! You have set a great example for young boys and athletes to look up to and words can't describe what I am feeling inside after watching such an amazing documentary last night. 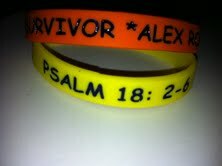 Waking up this morning floods memories with Alex surviving through the night and still being with us. On the night of the 6th.... I had no hope, no faith... I was going to be burying my son within the week. How am I going to survive losing my son? What am I going to say to his brothers? His father? It all changed for me when the nurse came in and asked me if when he flatlined if I wanted them to resuscitate? "I have 3 hours.... seriously I don't want to think about that right now... can you give me a minute to collect my thoughts and make a decision? " Thoughts running through my head.... when that time comes... will I be able to give up? what would be best for Alex? I don't want to cause him anymore pain than he has already endured. Do I quietly let him go in peace? I had to talk to his brothers and decide together what to do. Brooks and Nick with their precious faces looked at me and said "Don't give up on him momma".... "Keep fighting for him until he can't fight anymore"..."Bring him back as many times as you need to and let him keep fighting". IT WAS A DONE DEAL! I was going to fight for my boy and NOT STOP! It was at that point that we prayed... HARDER THAN I HAVE EVER PRAYED BEFORE.... BEGGING, PLEADING, CRYING TO GOD.... PLEASE SAVE MY BOY! YOU CAN USE HIM TO DO GREAT THINGS FOR YOU...WHAT A TESTIMONY THAT WILL BE LORD IF YOU SAVE HIM! I gave him everything I had that night..... I learned to put my faith with every ounce of my being in HIM! I have never ever had to do that until now. I had nothing left so what could I possibly lose... I had EVERYTHING to gain! This is what it's all about..... Putting complete and total faith in God... Giving it all to Him and letting Him do the work that only He can! And let me tell you what....A Huge sense of relief came over me... a peace I cannot explain! 3 hours turned into 5 hours turned into 8 hours and On the 7th day God performed a TRUE MIRACLE in saving Alex's life... something the doctor could not explain when he took me in that little room to give me an update. As I am walking from Alex's room to the waiting room, the neurosurgeon calls my name and says he needs to talk to me. I immediately freak out and am frantic looking for Brian and Chad because I don't want the bad news by myself.... I need some support in there to bare the brunt of the blow with me. As we go to sit down in the room, he says... "I actually have some good news". I look at Chad, he looks at me.... what could it be. Surely his brain hasn't stopped bleeding... they said it was impossible! The injuries that his brain suffered..... there was nothing more they could do. WELL AGAIN... ON THE 7TH DAY GOD PERFORMED A MIRACLE ON ALEX ROSS! Doctor Arcy looks at us and says... "The bleeding has stopped". Chad had to catch himself and we asked again... "What did you say?" "The bleeding has stopped and I can't explain it". And as I scooted from the back of the chair and up into an upright position I looked him square in the face and said... " I'll tell you what that is.... THAT IS A MIRACLE OF GOD!" He looked at me and said "You are probably right!" The doctors have not been able to explain his progress throughout this whole ordeal. Alex is doing things he should NOT be doing with the injury that he suffered. I sit here and remember all the feelings that I was feeling and I remember walking into the waiting room where atleast 100 people were waiting to hear what the doctor had to say. Chad and I had planned to walk in with a solemn face and then WOW them with the news of THE BLEEDING HAD STOPPED. I'll never forget their faces... kids, friends, family... SO MANY PEOPLE to WITNESS the miracle God had just performed on MY boy! As the words flowed from my lips and tears trickling down my face... "the bleeding has stopped." The clapping... the cheers... the amazement and shock in so many faces! THANK YOU GOD! Then I got the... "you had us fooled... you came in here making us think it was bad news"... hee hee :0) THAT WAS THE DAY THAT GOD GRABBED EVERYONE'S ATTENTION!!! He had done the unthinkable.... the impossible.... HE SAVED ALEX ROSS' LIFE! Again... THANK YOU GOD!! I think about how many lives Alex has touched.... so many were walking the wrong path.... had turned away from God.... non-believers NOW believe!! You ARE working miracles through my boy God....Thank you for giving us a second chance at life! I give you all the Honor, Glory and Praise! AMEN! WE GOT THIS!!! A quick thank you to all of you who blew my facebook page, email and phone up yesterday with soooo many encouraging and kind words.... remembering that it was the anniversary of that fateful day....THANK YOU! I had no idea so many of you remembered the day....or were still reading, lol. I have slacked off in my writings a lot so I figured I had lost so many of our followers .... yesterday confirmed that I still have so many many supporters out there that are still praying and following our progress. Alex continues to work hard at therapy and this is the year for many great things! Graduation is so close... right around the corner!! CAN'T WAIT! SO PROUD! I hate that he has missed his junior and senior years at high school... the best years of his life... but I am going to stay focused on the positives instead of the things that were taken away from him. THANK YOU my prayer warriors for sticking by our side and watching as my miracle boy recovers at superman speed! We couldn't have done it without you!!! ONE YEAR TODAY! 3 HOURS TURNED INTO 365 DAYS! THANK YOU GOD! THANK YOU GOD FOR ANOTHER YEAR WITH ALEX MICHAEL ROSS! I can’t believe today marks the year anniversary of that fateful day. It’s 4:30am, Alex just woke me up because he had to pee and I cannot for the life of me….go back to sleep…… a million things racing through my mind. I can’t tell you the last time he woke me up to go to the bathroom….. it’s been awhile now as he is on medication for frequent urination so he rarely wakes up to pee. I think he just wanted me up early today of all days lol! I can tell you how very thankful I am that he woke me up today for sure! A year ago today I was told I would only have him for 3 more hours. UNIMAGINABLE how I got thru that first night sitting here looking back. It all seems so surreal. Like… really… did that really happen? A mother’s worst nightmare… how did I, as a mother… get thru that? I sit here and look back at the crazy year I have had and I wouldn’t trade it for anything! I was told 3 hours….. 3 hours… I can’t even fatham that! Thank you God for showing me just how very real you are. Thank you for grabbing my attention…. Along with everyone else watching… thank you God for soooooo many things, but at this moment…. Thank you God for giving me my boy back, by performing a miracle with his life and saving him to do great things for YOU! 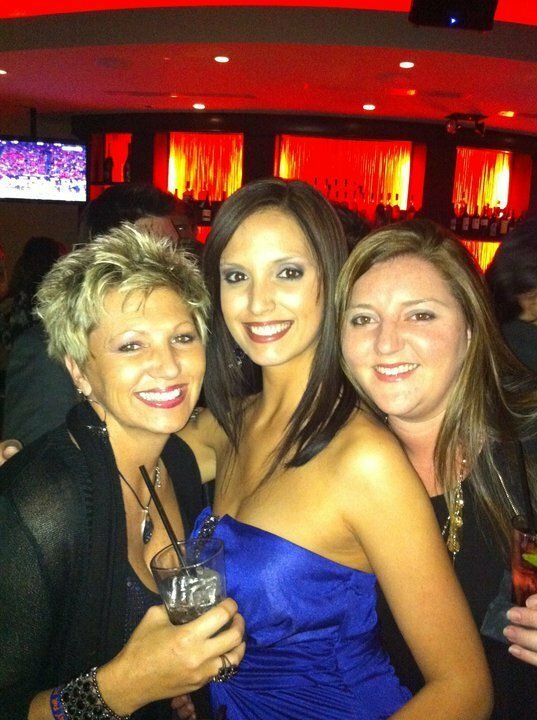 I learned the hard way that night…. GIVE IT TO GOD. Amazing the peace I felt once I did that night… I knew there was nothing that I or anyone else could do to save him. I just remember praying over and over and over again…. “Lord, please give me my son back. Let him come back to me and I promise you he will do great things for you. I don’t care if he is paralyzed from the neck down, I will take him anyway I can get him. I will deal with whatever comes my way as long as I can have him back!” I think he gave me a little more than I bargained for with Alex Michael Ross, lol! Crying and laughing at the same time as I write this…. So surreal! At this time, one year ago I was getting ready for work, Alex was getting ready for school. His car was broke down for the moment so I was dropping him off to Dax at McDonalds on my way to work. I loved our morning rides and had missed them when I used to drop him off at school before he got his license. It was MOM time…our quiet time together, one on one. It’s just crazy how even as I sit here, it all just doesn’t seem real…. As if it didn’t really happen. One phone call can change the rest of your life….how crazy is that? That I could be sitting at my desk one minute, not a care in the world and the next minute I am on the phone trying to figure out where Alex got shot. When the words come thru the phone “ In the Head”…. My whole body went numb. I remember thinking… “ Ok, he was shot… where like the arm, the foot…what”? I never imagined in the head… the right frontal lobe. HOW DOES ANYONE SURVIVE THAT? It shouldn’t be…. He shouldn’t have…. 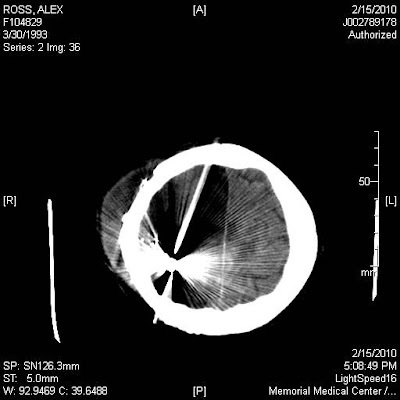 But by the Grace of God, Alex Michael SURVIVED something that the doctors can’t explain. In that little room… Dr. Arcy said “I’ve done all that I can do. He was bleeding so bad I had to close him back up in a hurry.” I could not grasp those words for anything….that was NOT what I wanted to hear and I was NOT going to accept that. People all around me freaking out and crying…. I was numb. I couldn’t cry…. I was in shock and disbelief that I only had 3 hours with Alex until he passed away forever. Brooks looked at me and said “ Mom, he was my best friend….. what am I going to do without him?” Tears streaming down my face as I write this….. Thank you God for saving us from a terrible heartache and void in our lives because I truly do NOT know what I would have done or how I would have gotten thru the loss of my son. And then on the other hand….. I am crying for the loss of who Alex once was. He loved to play basketball and was GOOD, run up trees and do backflips, run around and torment his brothers, a GREAT second baseman with quick hands and feet…. He loved making crazy videos and dancing! 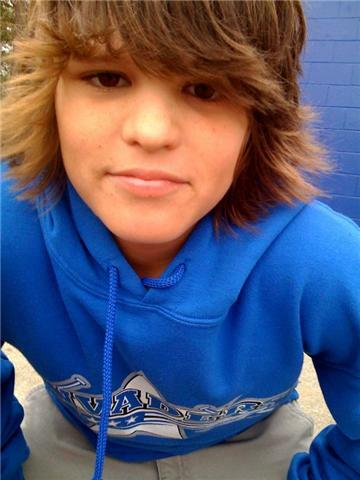 I miss him soooooo much and I know that I will never have that boy back….. the little boy with the awesome hair (smile). I have to focus on the positives and appreciate what I have in front of me at this very moment in my life. Thank you God so much for the many many blessings you have bestowed upon me. Alex is a miracle…what more could I ask for? I can take myself right back to that night in the hospital room in the blink of an eye and know how precious God is to me. I kept telling Alex… “Tell that brain of yours to stop bleeding… right now!” Brother Joe, Jonathan, Chad, Nick and I….. praying…. Crying….begging God to perform a miracle and bring Alex back to us. Thank you God! Thank you! Soooo many emotions running wild this morning… what a crazy year this has been. 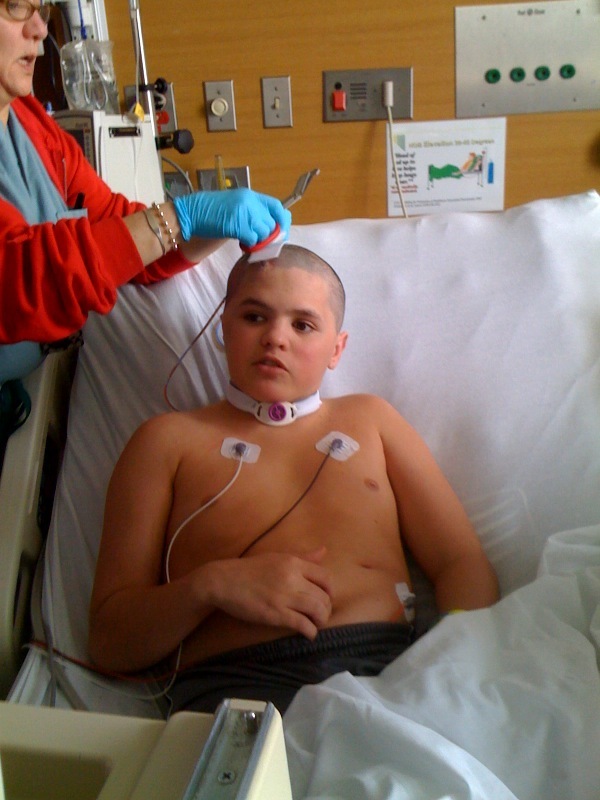 4 months in the hospitals….. 4 brain surgeries, a tracheostomy, a g-tube (feeding tube), 2 throat surgeries…. a total of more than 10 procedures where he was put under anesthesia. CRAZY! If you were to look at the cat scan of his brain….. it is only explainable that he is here as a miracle of God. There is no other explanation. With the bullet still lodged in his brain….. the cat scan looks as if the bullet spray painted his brains on a wall. Graphic I am sorry…. But that’s the only way to explain it. Like a burst…… there is nothing on the right side. I remember asking the nurse that night…. “ Is it possible for the bleeding to stop at all?”…. her reply “ Not likely. He has a very severe brain injury.”. IT IS POSSIBLE…. With HIM… ANYTHING IS POSSIBLE AND YOU BETTER BELIEVE IT! 3 hours turned into 5 hours turned into 8 hours turned into 365 days! THANK YOU JESUS! You know, as I sit here and write this I can reflect on the past year….. I certainly have been thru a lot myself. I see things thru a different set of eyes….. I am now in the handicap world of which none of us ever forsee ourselves. ONE PHONE CALL! Most of you probably never use the handicap bathroom now, lol….. I have shown you the flip side of the coin. I never realized why handicap parking spots were so big before….. it is so that people in wheelchairs can get in and out of the car… DUH! Hahahahahaha! Just things I never thought about before and took for granted. DRIVING … INDEPENDENCE …. WALKING … TALKING …. CHEWING, SMILING, EATING… SPEAKING…..VISION …. things we all take for granted on a daily basis. Things that Alex had to learn to do all over again and still continues to retrain that brain on a daily basis to make that left arm move and to make those hips and left leg do what they need to do to be able to walk on his own. Yes he has come so far …. But he still has a very long way to go! We certainly have taken the scenic route, as I like to call it, every step of the way. Nothing has been easy on this roller coaster ride for sure! From surgeries, to dehydration, to poops in my car, to waiting on him hand and foot. WHAT A YEAR! He looks great…. He talks great…. To see him out and about you would never know he was shot in the head and that is why he is in a wheelchair. But trust me…. There are issues in the brain, the kinks if you will….. that still need to be worked out. He is OCD …. Those of you who are his facebook friends and see his posts… that should explain a few things. He will post the same thing like 5 times within a 10 minute period… sometimes changing a word or two, maybe. He says the craziest off the wall things…. Impulsive… VERY IMPULSIVE. IMPATIENT… to say the least. We have lots to work on mentally…. Socially acceptable things….. and hopefully with some great therapy we will get that squared away and back on track. If you talk to him or he texts you…. Please don’t take anything he says to heart. He knows not what he says may affect you or how it impacts you. There still is no filter and he says things with no emotion. He doesn’t process information the same as you and I. He has one emotion…. JOKESTER. Even though I am most thankful this is the one emotion I do get…. Sometimes it is not appropriate and he doesn’t get that. Even when he aggravates us or I get mad at him for something he shouldn’t be doing…. He will crack a joke or repeat a movie quote (of which he does ALL DAY LONG) to throw us off or make us laugh. There is no sadness, no depression, no tears, no anger out of him. I am sooo thankful this is the emotion that stuck with him thru this. Things could always be so much worse and I see that on a daily basis as we go to therapy. My son has his sight… it might not be normal and he may never drive again, but he can see! My son can not walk by himself…. But he will one day! My son’s left arm doesn’t work and he only has one arm to do things with….. atleast he has ONE that works…. The other will ONE day! My son is in a wheelchair…. BUT I HAVE HIM HERE! Soooo many people have it worse off than us…. This I know. Yes we have struggles on a daily basis and my life is not easy by any means. WE GOT THIS! Alex and Brooks have both grown up this past year…. Literally both hit puberty at the same time and grew into young gentlemen. I look at their pictures from the beginning of last year and they were babies. Both now taller and weighing more than their momma! A crazy year I tell ya! 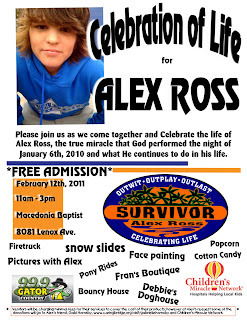 Please pray that the “Celebration of Life” event for Alex comes to light and that all obstacles are lifted. Sooo many of you want to meet him and I can assure you …. He wants to meet you as well! A special thank you to Kimberly Screws and Melanie Clough as they have diligently been working behind the scenes to make this happen! I just don’t have the time in my day to make all the phone calls it is taking to get the permits and venue up and running. We are focusing on January 22nd at this point so stay tuned and hopefully we will have it locked in soon! Alex is very impatient and wants it this weekend as I had previously intended. However… my little 4 year old brain injured boy doesn’t understand all the things that go along with planning an event of this nature. GOD LOVE HIM! So many of you comment on what an amazing woman and mother I am … thank you. I say this to you… “ I am in survival mode. I am not doing anything different than any parent in my situation wouldn’t do for their child”. True… some can endure more than others… some may be stronger than others. God doesn’t give us what we can’t handle. I have had a talk with Him today and told Him that I am stronger because of Him, however… I have had my fill and now I would like to relax this year, lol! Don’t forget to tune into ESPN tonight at 7 pm…. 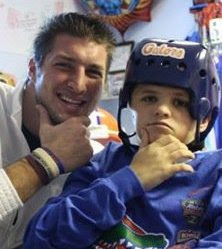 Alex will be in Tim Tebow’s Documentary, TIM TEBOW: EVERYTHING IN BETWEEN. As I close my writing today, I leave you with some vivid pictures of how far we have come. Given three hours to live and with the miracle of God…. Making it another 365 days! THANK YOU GOD FOR ONE MORE DAY WITH ALEX MICHAEL ROSS!